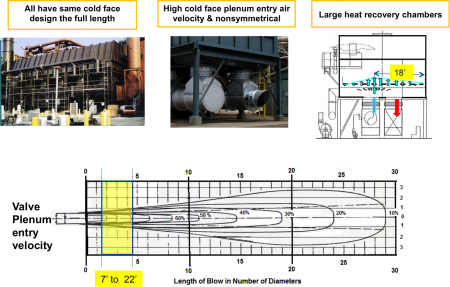 Major RTO Evolution Features | Nestec, Inc.
Last month we discussed the history of industrial regenerative heat recovery from the first brick chambers used in the 1880s, to the ceramic saddle media systems of the 1970s, and concluding with today’s state-of-the-art, structured (monolithic) ceramic blocks that offer thermal recovery efficiencies as high as 96 percent. This month we’d like to go into greater detail on some of the major features developed by NESTEC that are driving advancement in regenerative thermal oxidizer (RTO) design and implementation. NESTEC has been at the forefront of RTO development since the inception of the technology in the 1970s. Some of the major auxiliary features developed by our staff include: the integral horizontal shaft poppet valve, uniform air flow distribution nozzle, and full-flow on-line bake-out (patent pending). In the early 2000s both our RTO and regenerative catalytic oxidizer (RCO) designs began incorporating specially tailored integral horizontal shaft poppet valves and cold face plenums. Previously, RTOs were modified to accommodate commercially available valves. Non-specialized parts couldn’t provide the uniform air distribution needed for high-efficiency operation. The valve system on an RTO controls or alternates air flow from preheat to recovery mode and is at the heart of the entire process. If a valve fails, so does the RTO system. Fast-acting, horizontal shaft poppet valves require far fewer make-or-break seat contacts than traditional valve types, substantially reducing the risk of valve failure. Moreover, test reports show that when the effect of flow-control valve leakage and chamber flushing bypass are controlled by reliable, consistent valve seating, nearly 100 percent of volatile organic compounds (VOCs) are destroyed. RTOs require a chamber between the inlet/outlet valve and the heat recovery bed called the cold face plenum. NESTEC’s design substantially reduces the necessary volume of this space. This space-saving results in fewer un-combusted VOCs. The NESTEC uniform air flow nozzle, when used in conjunction with an integral horizontal-shaft poppet valve, increases thermal energy recovery (TER) by 1 to 2%, which provides reduced operating costs while using 25 to 35% less fuel. Every oven needs a good self-cleaning feature, and our system not only provides a high temperature bake-out of each heat recovery chamber, but it does its job without requiring scheduled down times or a lengthy maintenance process. Older, off-line bake-outs disrupt smooth operation of an RTO and can result in runaway fires, excessive CO emissions, and high opacity conditions. Many of NESTEC’s features can be added to existing RTOs presently in operation today. For assistance from our extensive experience, call or e-mail NESTEC Inc. for a free evaluation of your VOC control equipment needs.